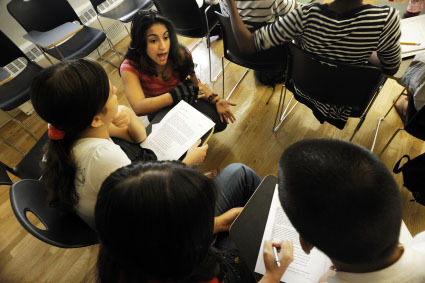 New School students engage with social justice in and out of the classroom. A diverse learning community is a critical component of The New School, a university founded to challenge traditional notions of higher education. At The New School, the Spring 2010 formation of the Social Justice Committee opens a new chapter in how the university defines, interprets, and realizes our historic commitment to social justice today. The great traditions of this university, welcoming at-risk scholars, teaching working adults, promoting civic participation, encouraging social progressivism, demonstrate that The New School must always look forward to what we can do to foster a climate of equality and fairness,, says Provost Tim Marshall, who facilitated the formation of the committee and serves as one of its two co-chairs. The Social Justice Committee operates with these traditions in mind. The committee, whose co-chair is New School for General Studies and Milano The New School for Management and Urban Policy faculty member Darrick Hamilton, was formed in response to the palpable energy surrounding social justice, in academic divisions, among student organizations, and in administrative areas such as student services. Composed of faculty, administrators, and students, this university-wide body will meet regularly to explore relevant issues, assess the status of current social justice initiatives, and develop a set of recommendations for how The New School can further engage social justice issues. The committee’s overarching goal is to ensure that The New School is as inclusive and welcoming as possible. Social justice is a broad term meant to encourage proactive behavior based on values of equality and diversity; it reflects a desire to understand and address social and economic inequalities. Broader than but inclusive of diversity,, the goal of social justice is to determine what work must be done to establish a society where all enjoy the same resources, respect, and support. Among its initiatives, social justice, includes students’ community outreach in public schools, improvements in the university’s structures and systems, and support for the needs of transgender students. The Provost’s Office has created a webpage where you can read the Social Justice Committee’s organizing principles.